This top 50 of amazing smoothie recipes is based on an internet poll. Try them all and read about their health and nutritional benefits. gorgeous taste. 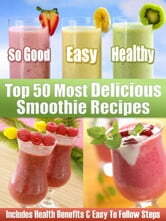 These smoothies are delicious at anytime of the year! Easy to follow steps so anyone can make and enjoy them! them in no time at all. benefits of each recipe & interesting facts about the ingredients. Tried, Tested and SO GOOD!